i will admit off the bat that this took a good chunk of my day to make. that being said, you could shortcut several parts of this. i used 2 sauces, a creamy cauliflower and a cashew sundried tomato. also, have you had lasagna with fresh pasta? IT IS A DIFFERENT THING and it is a very good different thing. so if you’re going to shortcut something i would recommend making a straight up tomato sauce lasagna but making your noodles. sauté onion with oil and once browned, add mushrooms and a pinch of salt. cook until mushrooms begin to brown, add 2 cloves minced garlic and cook for another minute. put aside. give the spinach a quite sauté with the remaining garlic and lots of black pepper. take the squash and pull all the spaghetti-ish flesh out with a fork and put aside. i used pretty much an entire batch of this creamy cauliflower alfredo sauce, with 1/2 c. less liquid so that it was pretty thick. blend it all up using as much almond milk/water as you need to get it to blend without becoming runny. i have a crappy blender so i had to use quite a bit, if you do too then just add a couple tbsp of nutritional yeast to thicken it up. taste and season with salt and pepper. I used the same pasta recipe i’ve been using for all this stuff. one batch made a couple noodles extra, which is about right because a couple might got screwed up when boiling or whatever. just divide it in 4, roll it out into a big rectangle and using a very sharp knife or a pizza cutter, cut into 4inch strips and put aside to dry a bit (not overlapping). Boil 3 or 4 at a time in a large pot of salted boiling water for 1-2 minutes. be gentle putting them in the pot! 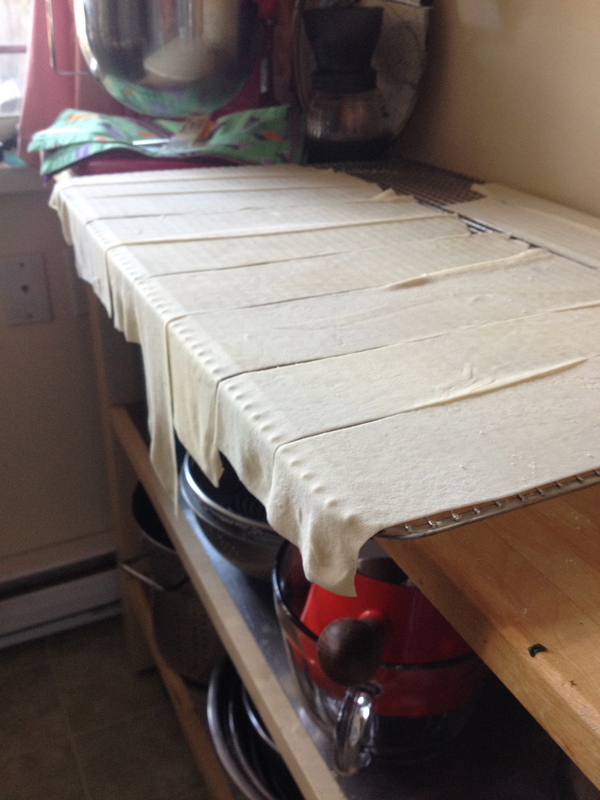 then drape over a cooling rack or the edge of a big strainer or something like that. just so they don’t touch, or touch themselves and can let a bit of water drip off. spoon enough cauliflower sauce into the bottom of your pan to cover then add a layer of pasta, overlapping slightly. add a layer or the cashew sauce (about half of it) then evenly top with all the mushrooms. add another layer of pasta, top with cauliflower sauce and top with a layer of spaghetti squash. then pasta, remaining cashew sauce then spinach, then another pasta layer, another cauliflower + squash layer and a last pasta layer. cover with remaining cauliflower sauce, sprinkle with salt, pepper and nutritional yeast and bake at 350 for 40 minutes. 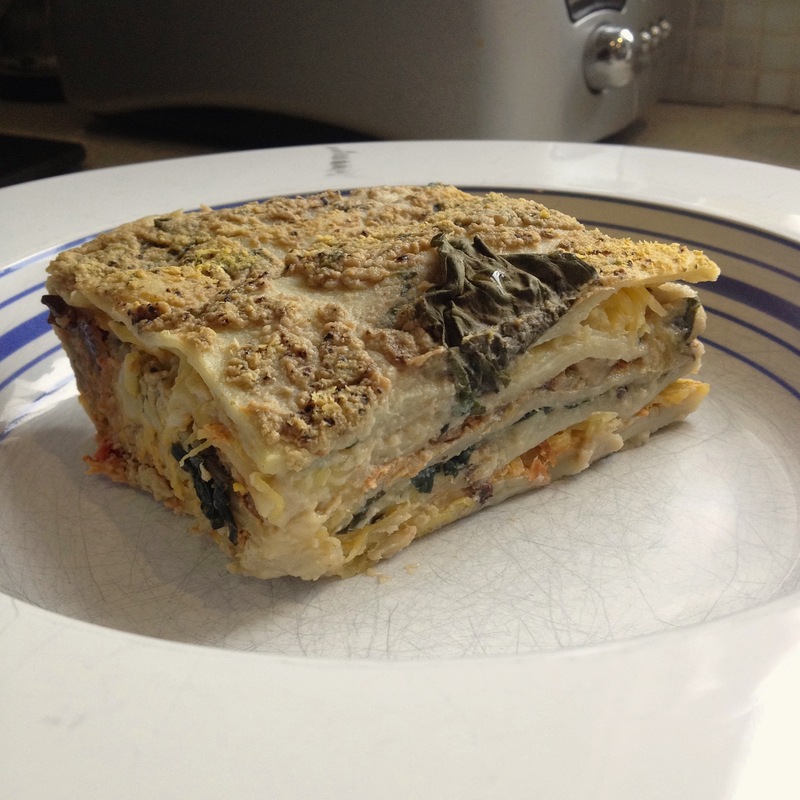 *you can, of course, do this in whatever combo you want and depending how thin you got your pasta, you may have less layers than this in which case, just make thicker filling layers! LET COOL FOR AT LEAST 15 MINUTES. this is a rule i have always known but never been able to hold myself to until this time but it makes a big difference for serving it. if you don’t wait it will be really hard to slice and plate.